I really enjoy watching my wife play Mass Effect and other video games. She believes what the game tells her. If a character says “We’re running out of time, we need to get out of here,” she’ll drop everything and sprint to the door. If a big enemy that looks tough appears, she’ll retreat and hide and hesitate to attack it. On the other hand, I have so much experience with games, I’m always looking behind the scenes. I know that, no matter how much people shout and the screen shakes, I’m not in any rush for time unless there’s a timer on the screen. If a big enemy appears, it doesn’t matter; they’re going to be different from other enemies, but they’ll still be in the same power range. Both situations don’t get my adrenaline pumping like they should. My advice to designers is to throw in unusual situations every now and then to shake up jaded gamers. Give us fights that we can’t win. Give us dialog that we actually need to listen to. Give us situations both where the obvious solution is the right one, and the obvious solution is inefficient. Help us rebuild that suspension of disbelief, so that we can actually fear our enemies and rejoice in our victories again. In this sense, old games had more going for them regarding emergent behavior. If I’m playing Doom, I open a door, and a horde of demons turns toward me, it’s possible that I just don’t have enough ammunition to win. The demons aren’t being sent out in waves designed to give me enough time to reload and recharge my shields in between; if I attract too much attention or don’t kill them efficiently, I will be overrun. That isn’t to say that old games are harder; just that they respond more directly and clearly to my decisions. Video gaming is just such a young industry, and it’s incredible how much connection we have to our history. Most of the names that built the foundation of gaming are still making games today. Many of these early games are still fun to play, and still have active communities. Furthermore, it’s incredible how far and how fast we’ve come. In 1990, Carmack overcame a seemingly insurmountable technical hurdle – scrolling the screen left to right. 20 years later – one generation! – and we’ve got the near-photorealism of Crysis. I hope the next 20 years bring an even greater leap in games – but I also hope we stay connected to our history. Edit: I just finished the book, and I realize that there’s a disadvantage to studying history in such a young industry, too: it’s not done. 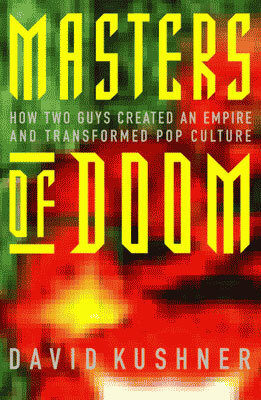 Masters of Doom was published in 2003. It ends with id in the process of making Doom 3, and Romero just starting up Monkeystone Games. And their stories are continuing; Carmack is only 39, Romero 42. These guys have decades of games left in them. So while Masters of Doom is a great read, it feels a bit like id’s shareware model for Doom: it’s just the first episode of a much longer story.